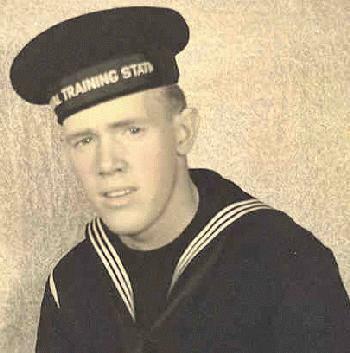 Oscar M. Jacobson served aboard the USS West Virginia from December 1940 until December 7, 1941. 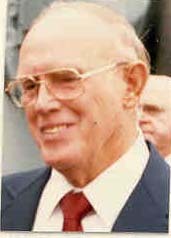 During the attack on Pearl harbor, Jake was on liberty in Oahu. Jake strongly believes that if he were on the ship, he would have been killed. When Jake tried to get to his ship to assist during the attack, his launch was waved away from the burning ship by those aboard. He spent the morning aboard the USS Tangier, assisting her crew with the defense. In the confusion, the Navy reported Jake missing and presumed dead. 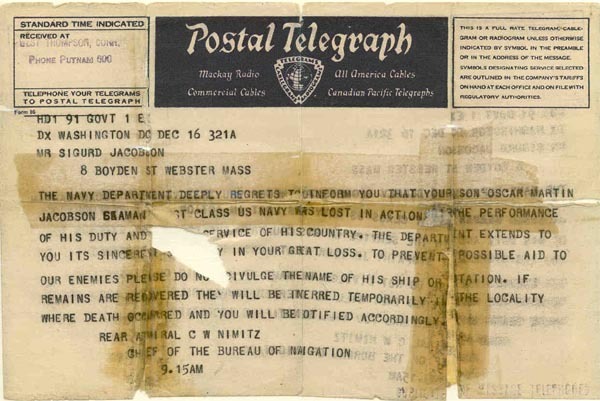 His family received the telegram on December 16, 1941. 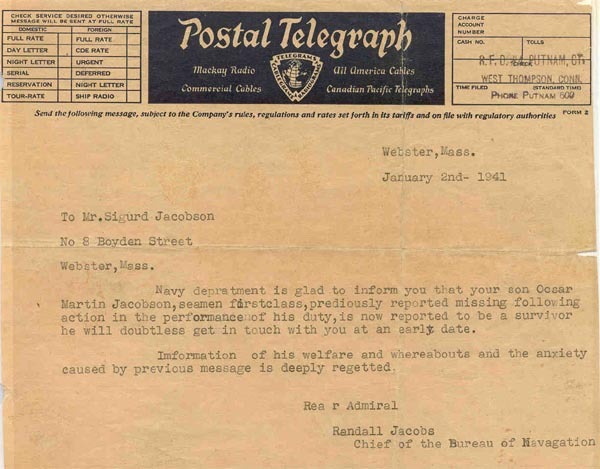 It wasn't until January 2, 1942 that they received a telegram from the Navy stating that he was alive. He went on to serve aboard the USS Salt Lake City for most of the war. This telegram was sent to Jake's family after Pearl Harbor. He carried it in his wallet for about 50 years. 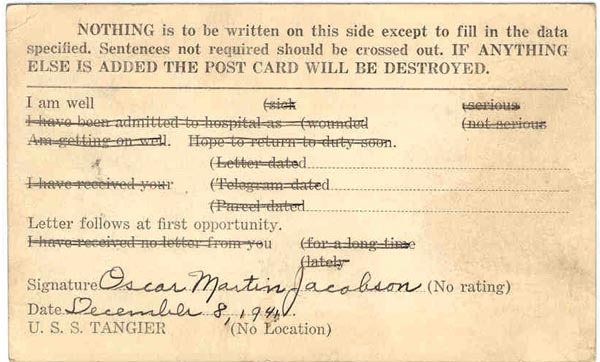 This postcard was sent by Jake to his family on Dec. 8, 1941. It was received by his family the day before the telegram above. This telegram was sent to Jake's family on Jan. 2, 1942. Click Here to see a newspaper article from December 1941. Click Here to see a newspaper interview from December 1981. Click Here to see a newspaper interview from December 1982.